Ellie Lawson, singer songwriter is the first to tour high street fashion stores. The socially conscious singer-songwriter who is working with the charity War Child has her own label called 'Create your Own reality' and previously sold 25,000 records touring with the USA book retailer Barnes and Noble. She is currently selling albums and raising finance with her 'create my next album with me' campaign via her shop at http://www.ellielawson.com. Lawson's performances include opening for the BBC presenter Jimmy Doherty's festival 'Harvest at Jimmy's Farm' last September in Suffolk where KT Tunstall and Jose Gonzalez headlined. She has also previously played at the Abbey Road studios as part of the Brit awards and performed on the Ellen DeGeneres show where Ellen predicted live on air that Ellie would become 'the hugest, hugest star.' 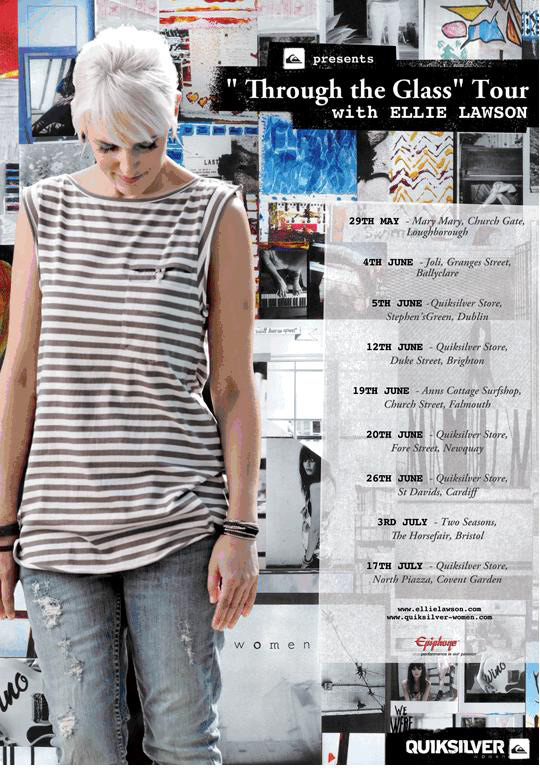 Gibson are proud to support Ellie Lawson who plays an EJ-200 acoustic guitar and we wish her every success with the imminent Quiksilver tour dates.